When it comes to choosing the ring that you will likely wear for the rest of your life, you cannot settle for any ordinary wedding ring. Platinum is an excellent choice for any groom that knows he wants durable quality and a charming white hue. Not only is platinum the rarest of all the precious metals, it is also regarded as being as beautiful as the diamonds it often accentuates. 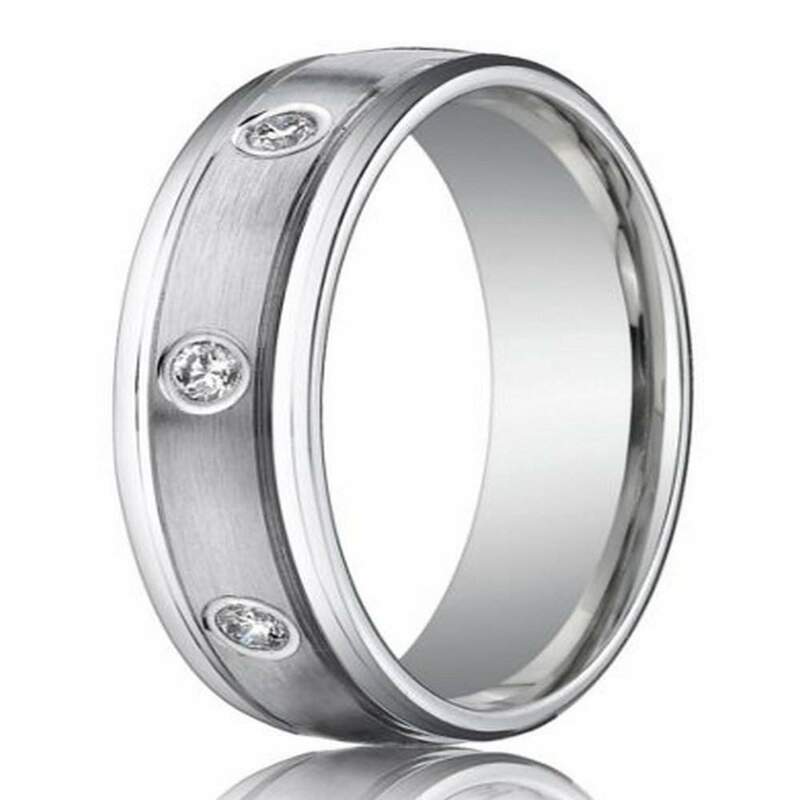 Our 6mm men’s 950-platinum bezel-set diamonds wedding band is no different. With its brilliant shine and a classic satin finish, we guarantee that you will enjoy your ring for years to come. Take a closer look at what sets our 6mm men’s 950-platinum bezel-set diamonds wedding band apart from the rest! Our 6mm men’s 950-platinum bezel-set diamonds wedding band is the perfect heirloom to symbolize your eternal commitment. Platinum symbolizes endurance, whereas diamonds symbolize love and prosperity. We can think of no better way to embody the most special day of your life than by choosing such a uniquely sophisticated ring. With a combined carat weight totaling to 0.32, the eight stunning diamonds featured with this ring provide the perfect accent to any formal or casual ensemble. With a comfort-fit band, polished round edges, and unparalleled attention to detail, our 6mm men’s 950-platinum bezel-set diamonds wedding band will make you feel like the luckiest man alive. Make your day just a bit more special by adding a personalized engraving before completing your order. If you have any questions about our jewelry selection, our engraving services, or finding the right size, contact us today for further assistance. Ring received in excellent condition as scheduled. Engraving as specified. Nice work.